Anka Sings Sinatra. This is truly the stuff that phenomenal concerts are made of. 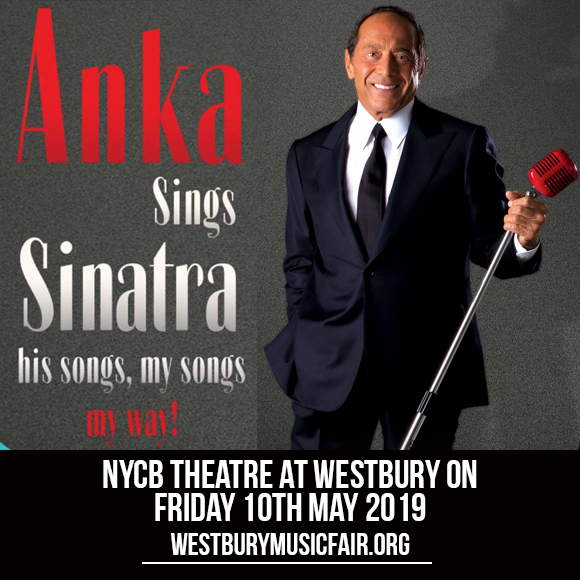 Paul Anka pays homage to the songs of the Chairman of the Board, none other Frank Sinatra in a concert aptly entitled Anka Sings Sinatra: His Songs, My Songs, My Way! This momentous performance is set to be staged at the NYCB Theatre at Westbury on Friday 10th May 2019. There's no need for an explanation as to why tickets sales are moving briskly. Truly an event that would be a throwback to golden memories and carve new memories with friends, family, and loved ones across all generations. Before you walk down memory lane, run fast and get those tickets now! Six decades on to his music career, Paul Anka is still at the top of his game. His passionate spirit and unstoppable energy defies age and encompasses a cross-section of generations. It is a known fact that Paul Anka penned the lyrics for "My Way", considered one of the greatest songs ever written of all time, and has been the signature song of the late great Frank Sinatra. For this extra special concert, Anka has chosen a theme that is truly close to his heart and will tug the heartstrings of his own and Sinatra's beloved fans: "Anka Sings Sinatra: His Songs, My Songs, My Way!". "The Anka Sings Sinatra tour will honor a great artist who has influenced me more than anyone else throughout my career, Frank Sinatra. It will also feature the hits that have spanned my career on this 60th anniversary year. It will be a night filled with his songs, my songs, my way!," says Anka. Paul Anka has captivated audiences with his timeless hits songs and his charismatic appeal. Ever since he shot up to fame as a teen idol in the 50s where fans swooned and screamed over his pretty boy looks and candy pop songs, Anka has evolved into a reputable artist, a prolific songwriter, a phenomenal performer, with a formidable staying power that encompasses generations. Getting a ticket to this show is like finding and possessing treasure. You can't let go of this opportunity to set your eyes on an international star and savor the moment of listening to some of the greatest songs ever written. Just like treasure, many would covet this golden opportunity. Now get on your way, buy your tickets now!